The white skirt and white top from my 6-PAC plan are finished – shown here both with and without a purchased cardigan, tucked in and untucked. The skirt is from a TNT self-draft, adjusted to add 1″ total through the hips and thighs to allow for wearing without shapewear (because I don’t plan to wear that around the house). I shortened it by 2″ as this is a casual skirt so knees showing are not an issue the way they might be in an office setting. The shorter length allowed me to eliminate the back vent, which made for faster sewing. Instead of a regular waistband, I used double-folded bias tape for bind the waist edge. morphed neckline from my simple black dress onto this pattern. I used the short version of the sleeve and it did not require any alteration. 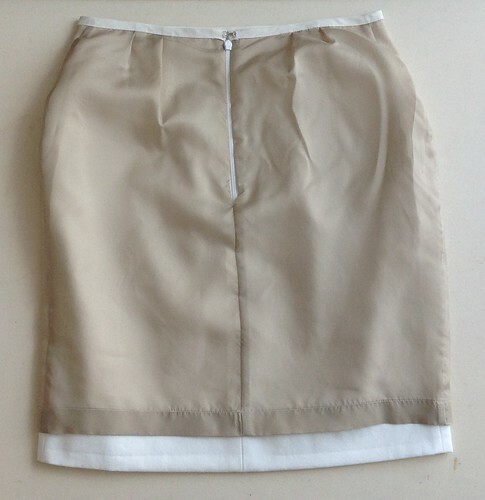 For the skirt, I used a piece of white cotton canvas that’s been sitting in my stash for a few years now. It came from Michael’s Fabrics. I had originally wanted a hem with multiple rows of topstitching, which just did not look right on this fabric. So I hemmed it by hand. 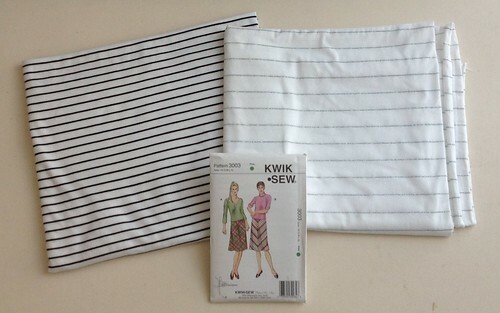 For the top, I used a white/silver cotton/lycra striped jersey from Fabric Mart. It appears to be sold out now but I bought it for $2.99/yd and wasn’t expecting too much from it. As it turns out, the fabric feels soft on the skin, the metallic stripes are not scratchy at all, and it did just fine under the iron. I have another yard and a half left so it will be making a reappearance. See? No seam allowances showing. It would have driven me nuts to know that the lining was inside out. I would think about it every time I wear it which means I wouldn’t wear it very often. It was worth the little bit of time to rip out the stitching at the waist and put the lining back in, correctly. The top isn’t hemmed yet (which may or may not be obvious from the photos) but I wanted to take advantage of my husband’s generous picture-taking mood. I’ll hem it tomorrow after I figure out the best length. When I put on the top, the darts are in the right place but after a few minutes of movement, the front slides up a bit and doesn’t come back down (not on its own anyway; it does with a slight tug). I am not entirely sure what causes this so I don’t quite know how to fix it. It doesn’t seem to be an issue of dart placement but rather as if the whole top wanted to rotate to the back a little. If that’s the case, won’t I have to redraw the armholes and maybe even the neckline? The skirt is very summery and comfortable. The fabric wrinkles a bit but not so much that I would worry about it. A bit like denim. The top is a comfy T-shirt that doesn’t look like a typical one. I like this neckline a lot, it may just become my go-to neckline. I think it’s better untucked so I will hem it accordingly. After the dart/rotation issue is fixed, this will be my new TNT top pattern. Not visible in the pictures (I hope) was the pain I felt in those heels. They are my favorite sandals but a recent soft tissue injury to my left ankle makes it quite painful to put my foot in that position. Dorsiflexed is better. I am also grounded from running for a week. (Ok, so the doctor may have said something about 2-4 weeks but I didn’t hear that part very well.) At least it’s not the right foot – that’s my pedal foot. Next up is a pair of pants and a dress, and I’m also making good progress on my Viajante shawl, so stay tuned. Cute summery outfit. I wonder if the top rides up because it is tight? Maybe try next one with a bit more room around the bust? You can always later take it in if you think it is too baggy. Cute outfit! When I read how your top wants to scoot up in the front, it made me think maybe you need a forward shoulder adjustment? Can’t tell by the photos. I’ve had that happen when my shoulder was set too far back. I’ve also had it happen when my top was too snug, like Vicki ^ suggested. Good luck! I like your choices for the six piece pac. The skirt is very neatly finished. If it rides up and forms a wrinkle above your bust, that means it’s too tight. If the dart placement is too high but there’s no excess fabric, you just need to lower the dart. Toto je super, ja hlasujem za nezapravené tričko. Hi, Alexandra, love your outfits and your approach to wardrobe planning. Regarding your knit top, I’m thinking if your bust dart is riding up that it might be that you need to resize tops for a larger cup size. I’ve had the same problem with some close fitting tops – they’re not overly tight but the dart starts riding up. So you might want to compare your high bust measurement to bust measurement – I think it’s 3″ or more difference that identifies a C cup adjustment (commercial patterns do B cup sizing). www.threadsmagazine.com has excellent videos and articles on bust adjustments. Seems you have lots of thoughts for solutions – would love to see an update on what you determine. Hi there! I’m new to your blog and wanted to compliment you on the skirt and top! They look lovely on you. I have a top from Banana Republic that looks exactly like the striped knit you used and sounds the same from your description. It’s one of my favorite cooler weather tops – the BR design features a cowl neck and 3/4 sleeves and rounded hem but no darts. Shaping comes from the side seams and the collar insertion. You said u shortened your shoulder seam by 1/2″, which would affect your arm scythe. This (looks like to me) the shirt is bunching under your armpit and the dart is in the wrong place. Good luck, love your style!